The American holiday that would become known as Thanksgiving had its origins in Europe. Many towns and villages held celebrations to mark a plentiful harvest and blessings of the previous year. When the first Europeans came to America in the late 16th and early 17th centuries, they brought these harvest celebration traditions with them. Harvest celebrations and days of thanksgiving were held sporadically in the early colonies as no formal holiday existed. The First National Proclamation of Thanksgiving was issued by the Continental Congress from its temporary capitol in York, Pennsylvania in 1777. Thanksgiving has been celebrated as a national holiday since 1863 when it was designated by President Abraham Lincoln. Over the years since the first celebrations were held, many types of table wares have held the Thanksgiving holiday meal. From deer and squash on wooden bowls and pewter dishes, to turkey and mashed potatoes on disposable plastic plates; the feast is served on the popular dishes of the day. From the time of the first national Thanksgiving proclamation, the holiday meal would have been served on the fashionable table wares of the day including creamware and pearlware. Creamware and pearlware were fine earthenware ceramics manufactured in England from the mid-18th century through the 1840s. Creamware is a cream-colored porous ceramic that appears yellow or green where it pools in crevices. Pearlware appears white or slightly blue-tinted to the eye and pools blue in crevices. These ceramic types were produced in a large variety of vessel forms, sizes, decorative styles, and colors, and remain as highly popular today as they did in the decades around the turn of the 19th century. Creamware and pearlware are found on most archaeological sites of that time period and the State Museum of Pennsylvania collections hold many exceptional examples of these ceramic types. A large variety of shell-edged pearlware vessels were recovered from Philadelphia Market Street Site 36Ph001 in the 1970s, including different sizes and shapes of food serving dishes and serving platters. Many of these pieces are decorated with a blue shell-edged rim pattern. In the late 18th and early 19th centuries, holiday meals may have consisted of many courses of meats, wild game, and seafood with accompanying vegetable and side dishes. Sauces, creams, and gravies would have been provided to pour on top. Several blue shell-edged pearlware gravy or cream boats are part of this collection. A table setting of the time would have consisted of numerous wine, liquor, and drinking glasses; individual place settings of up to 24 pieces; and different size plates and bowls for each course of food. These pearlware plates and bowls with green shell-edged rims were also recovered from site 36Ph001. Large creamware serving platters may have held meats such as turkey, chicken, fish, or pork. Creamware was available in several popular patterns. The serving platters pictured here have Feather edge and Royal edge rim patterns. Creamware table settings were available in the Feather edge and Royal edge patterns, as well as in the Queens pattern, octagonal shaped rims, and several other patterns. Queen’s pattern or Queensware was named for its popularity with British Queen Charlotte. Pearlware table wares with transfer-printed decorations became popular around the turn of the 19th century. Transfer printing involved transferring an inked design from a copper plate onto a ceramic vessel. Early transfer print pieces were available in blue, with later colors developing in black, brown, red, purple, and green. These pieces often exhibit oriental scenes, pastoral landscapes, or biblical and romantic motifs and were very popular at the time. The Head House and Commuter Tunnel sites in Philadelphia produced many beautiful ceramics including a number of transfer-printed pearlware vessels shown here. Creamware and pearlware vessels were also produced using many other decorative techniques including handpainting, dipping (annular, mocha, banded), sponging, luster glazing, enameling, embossing, and encrusting (gritted). The great popularity of creamware and pearlware ceramics finally began to die out in the mid-1800s, making way for whiteware and ironstone. No matter how you choose to enjoy your Thanksgiving dinner – whether on grandma’s antique china or on Styrofoam plates – we in the Section of Archaeology wish you a terrific holiday! And should you decide you would like to set your table with some lovely creamware or pearlware, there are many websites where you can purchase these pieces , including this beautiful, 17-piece creamware set - https://www.1stdibs.com/furniture/dining-entertaining/dinner-plates/english-pottery-creamware-blue-enamel-shell-edge-dessert-service/id-f_897887/. Thank you to our followers, volunteers and colleagues who help us in our efforts to preserve the past for the future. We have much to be thankful for and hope you’ll continue to follow our blog and visit with us in the future. 2017 History of Thanksgiving. History Channel website, at http://www.history.com/topics/thanksgiving/history-of-thanksgiving. 2002 Diagnostic Artifacts in Maryland. 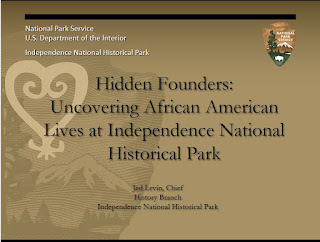 Jefferson Patterson Park & Museum website, at https://www.jefpat.org/diagnostic/index.htm. 2017 Pilgrim Hall Museum website, at http://www.pilgrimhallmuseum.org/index.html. 2005 The Cooks Guide and Housekeeper’s & Butler’s Assistant website, at http://www.thecooksguide.com/articles/dining-etiquette.html. As many of you may know, we recently held or annual Workshops in Archaeology on October 28, 2017. 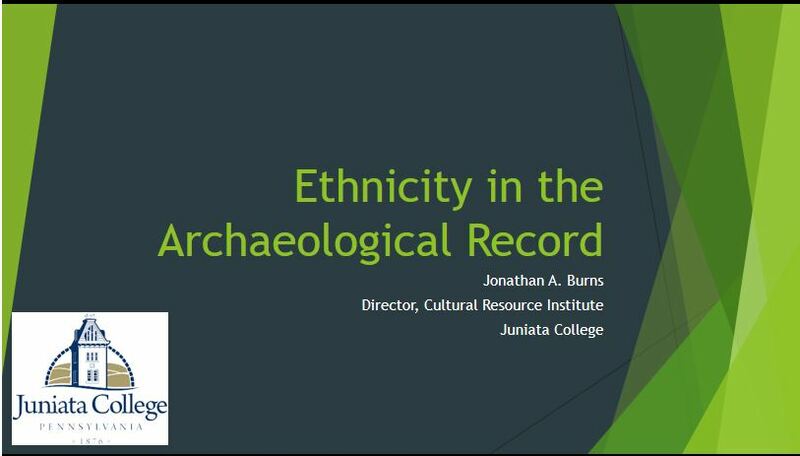 This year’s theme was Ethnicity in the Archaeological Record; and although attendance was a little lighter than usual, the papers presented and the discussions provoked were as interesting as ever. The day began with the Director of The State Museum of Pennsylvania, Beth Hager, welcoming everyone to the museum and generally setting the stage for this year’s installment of our workshops program. 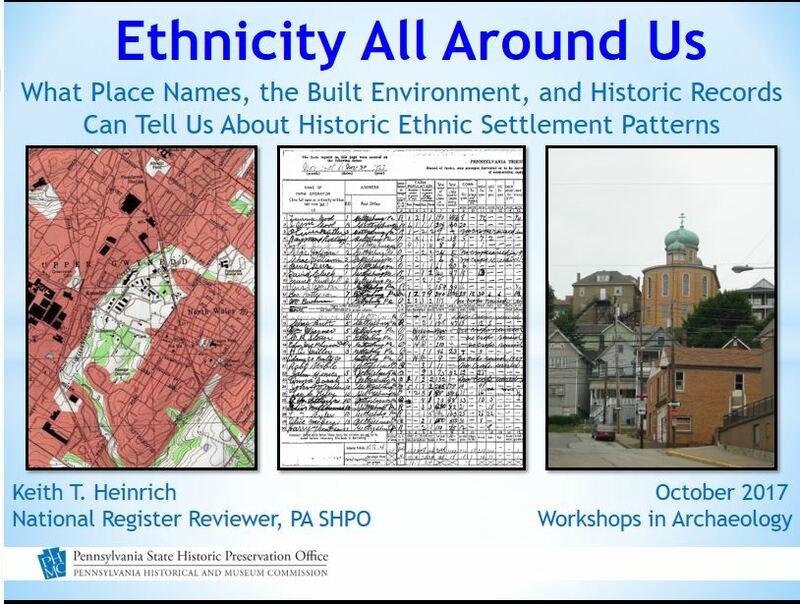 Dr. Kurt Carr briefly introduced the topic of the day and was followed by our first presenter, Keith Heinrich of Pennsylvania’s State Historic Preservation Office (SHPO). Keith suggested that in some cases (not all) place names can be an indicator of ethnicity. He discussed two examples, Germantown in Philadelphia and Polish Hill in Pittsburgh. Being an architectural historian, he was also able to describe structural clues to ethnicity. The second presentation of the morning was scheduled to be Brice Obermeyer of the Delaware Nation who unfortunately was unable to join us. 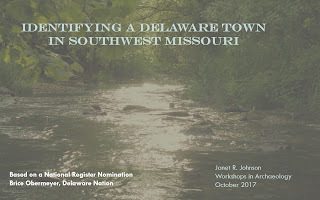 Nothing daunted, our own Janet Johnson was able to collaborate with Mr. Obermeyer and deliver an interesting paper identifying a Delaware village in Missouri. 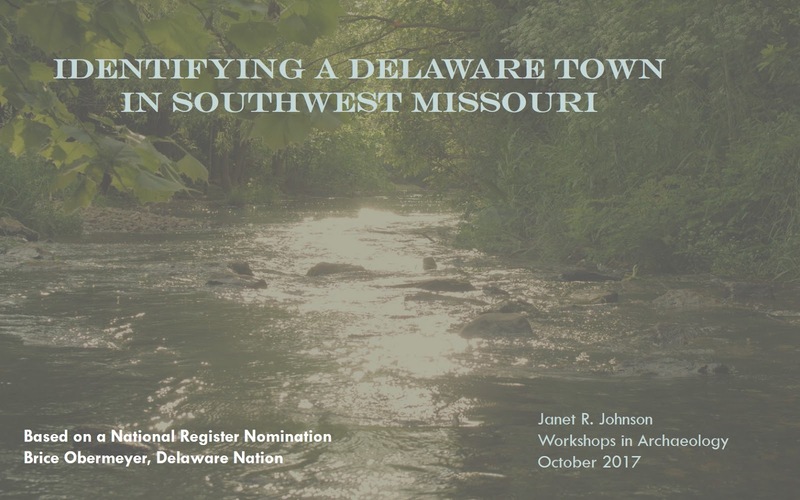 Janet drew comparisons between Delaware sites in Pennsylvania using clues such as personal ornaments (silver adornments, glass beads, brass points & cones…) as well as structural similarities in log cabin construction. 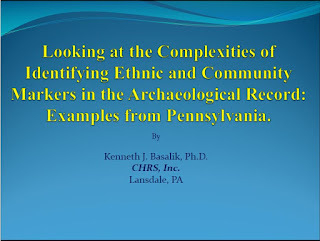 Session three was delivered by Ken Basalik from Cultural Heritage Research Services, Inc. (CHRS). 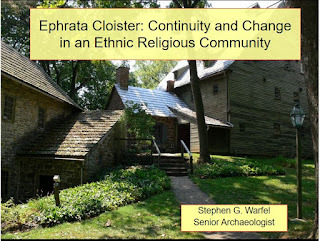 Ken delivered a cautionary summation of several historic sites in Pennsylvania acknowledging the difficulty of defining an ethnic group through both time and space. In some examples, physical alterations of structures through time were enough to disguise what could have been ethnic attributes. In other instances, the artifacts recovered alluded to one group or another with varying degrees of accuracy. 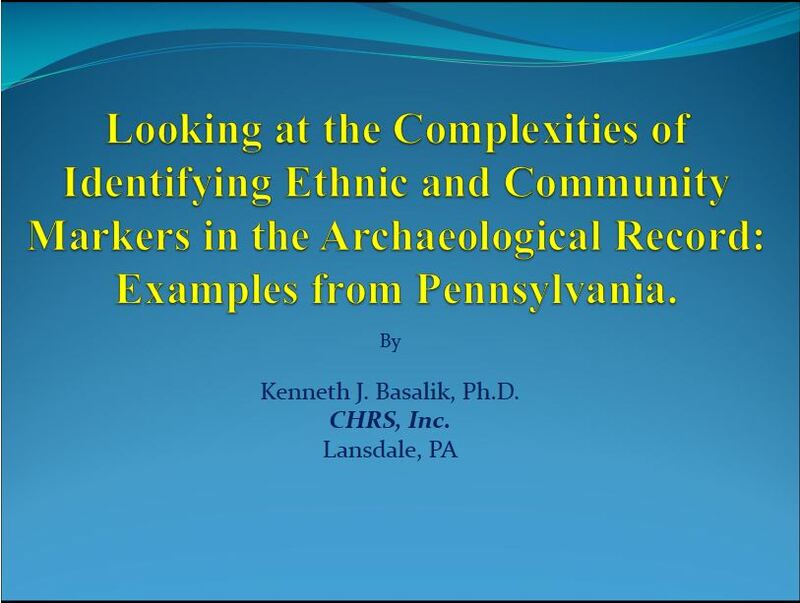 Concluding with the idea that in some cases, structures and artifacts may offer clues but the best way of deciphering ethnicity was historical documentation and the personal accounts of those that lived there, if available. 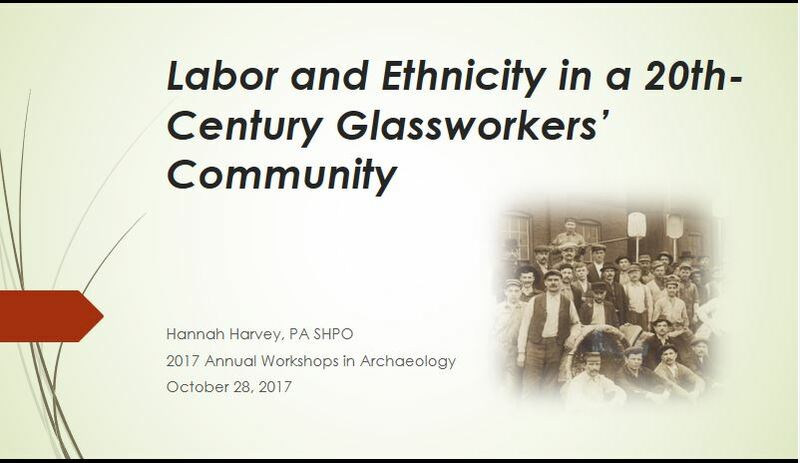 The fourth session of the morning was presented by Hannah Harvey, Pennsylvania’s State Historic Preservation Office (SHPO). 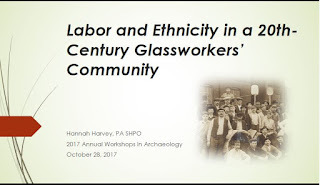 Her research was devoted exclusively to the company housing associated with the early 20th century Columbia Plate Glass Company near Blairsville in Indiana county. 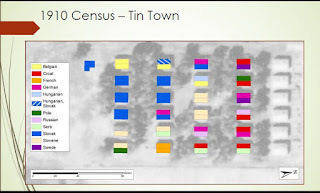 Using documentation, predominantly census records, she was successful in “mapping the social geography of the community”. Although she too found it difficult to corroborate ethnicity via excavation. 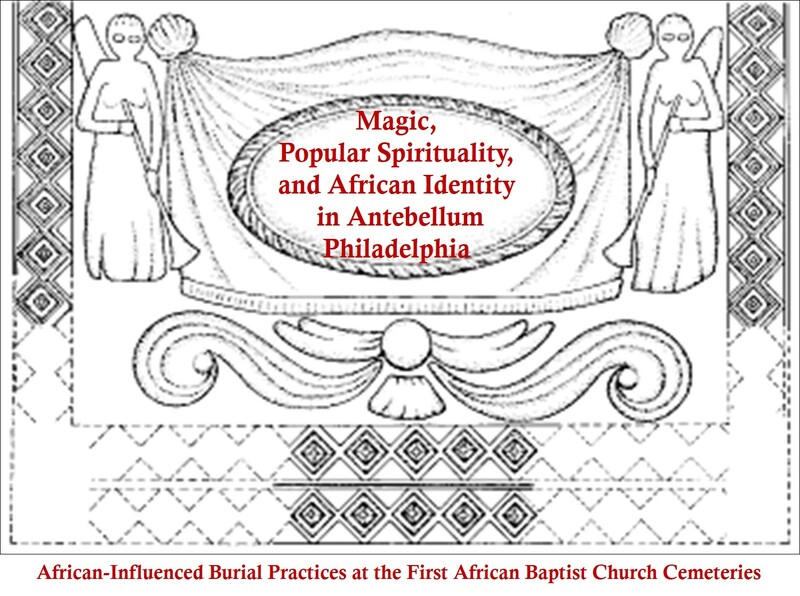 John P. McCarthy, Cultural Preservation Specialist with the Delaware Division of Parks and Recreation, delivered the fifth paper, a discussion of burial practices at two early 19th century African American cemeteries in Philadelphia. In several of the burials common yet unusual grave goods were interred with the deceased; coins, a shoe and a plate. 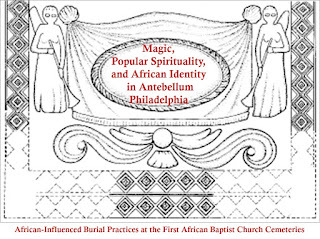 He contends that these are vestiges of spiritual non-Christian beliefs about the afterlife that developed in Africa and were demonstrative of an “African based social identity” in the face of growing hostility in 19th century Philadelphia. The next paper also dealt with African Americans in Philadelphia, this time in the late 18th century. 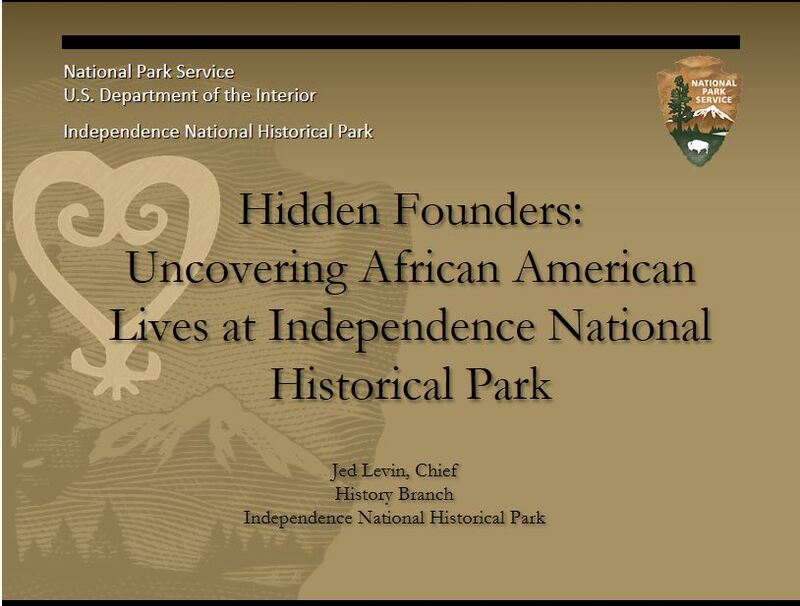 Jed Levin, Chief of the History Branch of the Independence National Historical Park, spoke of the excavations at the National Constitution Center and the President’s House over the past 15 years and detailed the contrasting stories of two African Americans in Revolutionary War era Philadelphia. One, James Oronoco Dexter a free coachmen and Ona Judge, Martha Washington’s enslaved seamstress. Using both historical documentation and the archaeology he was able to construct a forgotten piece of our collective national history. Our former Senior Archaeology Curator Steve Warfel spoke about the German religious community at Ephrata Cloister during the mid-18th century. Steve’s presentation discussed the groups strict, pious, religious beliefs and how they changed as a result of internal and external pressures. Some of these changes are reflected in the historic documentation others are not, but are evident in the archaeological record. For example, their rules and beliefs are written about in several sources so they are known from the written record. One such rule of behavior was a belief in poverty, they thought personal property to be sinful, and yet redware dishes were recovered archaeologically that clearly had initials scratched into the base, marking it as belonging to someone. Demonstrating the transformation of their self-view, self-identification being at the core of the definition of ethnicity. 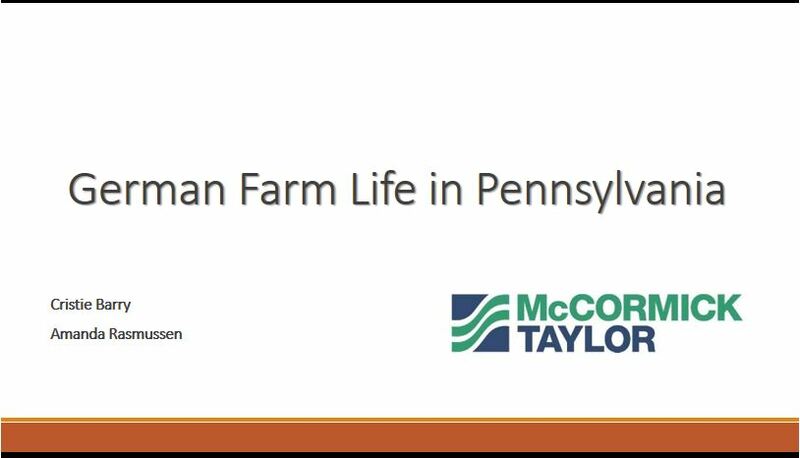 The final presentation of the day was delivered by two speakers, Cristie Barry and Amanda Rasmussen both from McCormick Taylor. 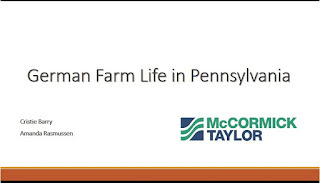 They also discussed Germans, focusing on two German farmsteads in eastern Pennsylvania tracing their development through the 18th and 19th centuries. Looking at the farm layout and the household artifacts as evidence of the frugal, self-sufficient nature of the German occupants. They too found that without the historical documentation it would have been difficult to establish an ethnic link based just on the archaeological record. At the conclusion of the presentations Jonathan Burns, Director of Juniata College’s Cultural Resource Institute, provided a closing summary to the day’s discussions. 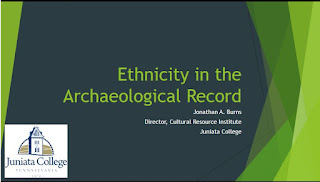 Many of the paper’s resolved that without the accompanying historic documentation it can be difficult to establish ethnicity in the archaeological record. The exception to this is finding a unique artifact or artifacts that are obvious ethnic calling cards. While conducting excavations at Fort Shirley in Huntingdon county a medallion / charm was recovered inscribed in Arabic “No God but Allah”. A clear marker of Muslim ethnicity, but an extremely rare find. Along with the presentations Steve Nissly was in attendance demonstrating his Flintnapping skills. 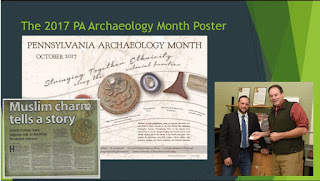 Artifact were being identified by Doug McLearen and Kira Heinrich, both from the Pennsylvania State Historic Preservation Office (SHPO). 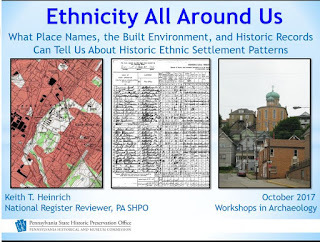 Noël Strattan and Hannah Harvey, also from the Pennsylvania State Historic Preservation Office (SHPO), explained the Cultural Resource Geographic Information System (CRGIS) and registered new sites. In all it was another successful Workshops in Archaeology concluding of course with a reception in the Hall of Anthropology where participants and attendants could snack and chat less formally about the day. Hopefully this glimpse of the Annual Workshops in Archaeology has been enough to entice you to join us in the future. Next year’s date is yet to be announced but we will post it here as soon as it is scheduled so stay tuned!